Urgent Reader Question: Return Rental Car to Closed Facility on Holiday Weekend? What happens when you have rented a car for only one day and you want to return it — but the facility from which you rented it is closed for two extra days because of a holiday weekend? Subsequent to reading this article pertaining to being careful about returning a rental car after hours to a facility which is closed, this is the question which Sher — who is a reader of The Gate — asked this morning. Apparently Sher rented a car from a facility which is closed both today and tomorrow for Memorial Day weekend; and Sher does not want to be charged for two extra days. Photograph ©2013 by Brian Cohen. Sher, I do not know how much you are paying per day for the rental car — nor do I know how bad is the area in which the rental car facility is located — so you will have to ask yourself if keeping the car for an extra two days is worth the peace of mind in knowing that you will have returned the car personally and without issue. Another option may be to return it to a different location which is open — such as at an airport. You may incur a drop-off fee for returning it to a different location; but will it be less expensive than keeping the car for two extra days? The problem with returning the car today is that it is your word which you are relying on should something happen to the car, which the rental car company would still consider being in your possession. Taking photographs as proof could help; but you would also need proof as to what day you took those photographs. This is an interesting situation — but does it differ from the one in the aforementioned article because an extra day is involved in which the rental car facility is closed? All photographs ©2013 by Brian Cohen. 2- I would still return to the location even thou they will be closed and follow the procedures for when they are closed to return the car. I would take numerous pics of the car making sure every side is taken and that from the pics it can be 100% can be seen it is on their lot.That way should any damage occur you have proof it wasnt damaged when you returned it. Thank you for giving some good advice, isaac. I appreciate it. 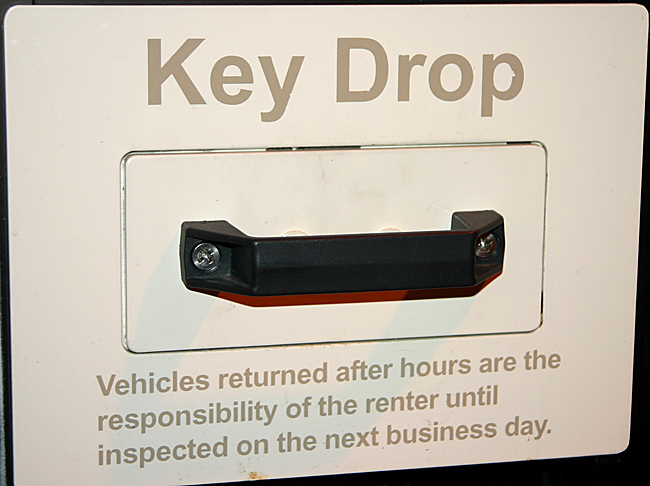 As the message on the drop box states, vehicles returned after-hours are always the responsibility of the renter. Even if you have proof that the vehicle was on the rental company’s property in perfect condition the time of drop off and the keys were in the drop box, you would still be responsible if the car was stolen, vandalized or otherwise damaged. Taking pictures is not going to make any difference in this situation. You have to decide whether you feel comfortable taking the risk or not. If you were to return the car when the location is open, you’d probably be charged for the extra days. However, there probably is a way to have your cake and eat it too so-to-speak. If it were me, I’d drop off the car an hour before the location opens on Tuesday morning. There’s a good chance that the location doesn’t have a way to track what time the keys were dropped in the drop box. If your reservation was for only one day, the rental location will probably only charge you for one day, assuming that you returned the rental at the time stated on your rental contract. 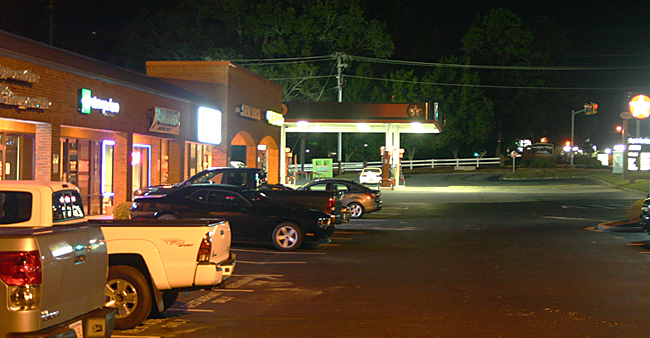 By waiting until an hour before opening, you greatly reduce the chance of something happening to the car since it’s not sitting overnight, ans since the location personnel probably won’t show up until closer to opening time, they won’t really know when the vehicle was returned unless they check their security footage. Bottom line, return just before the location opens to almost eliminate the risk and (probably) not get charged for any extra days. You were on my mind when I wrote the article, AutoSlash. I was going to contact you for your thoughts; but thank you for your response here. In the original article, Enterprise did charge me for an extra day and would not relent. I have not rented from that company since then. They missed out on plenty of opportunities from which Hertz — and, to a lesser extent, Avis — had already benefitted. I’m surprised the company entered into a contract that had the car being returned when the location was closed. Every time I’ve tried to do that it’s been made clear that I’d be charged for all time until the location opened again. If they’re not open until Tuesday, how do they know you returned the car within 24 hours, other than by looking at surveillance-camera footage? I guess if there’s a key drop, maybe there’s an electronic means they have of seeing when the key gets returned. But I’m not sure what’s to stop you from returning it early Tuesday morning before anyone else gets there and claiming you dropped it off today. That said, if they really do stop the charges after one day, then assuming you paid with a credit card that provides damage or theft insurance, or you have such insurance of your own that transfers to a rented car, I’d say it’s probably OK to leave it today unless it’s a dangerous neighborhood or it’s the only car on the lot. I agree with Isaac — take pictures. Checking whether or not the credit card you have used to rent the car has insurance which covers theft and damage is always a good idea, Seth, as that would give some peace of mind. I had something similar happen to us when we rented a car in Paris. We tried to return the car in the morning before our flight, but they weren’t open. We just parked the car in front of the shop and slid the keys through the window slot. We received additional charges for an extra week of rental, which we easily disputed when showing our boarding passes. Still, it was an unnecessary hassle.